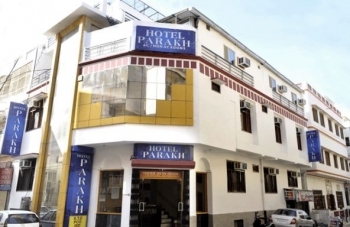 Hotel Parakh in Haridwar is one of the favorite resting shade for pilgrims and tourists alike. Since Haridwar is the threshold to the four pilgrimages of Uttarakhand, this semi deluxe hotel in Haridwar being centrally located near to the ghat is favoured for its warm personal service and sunny rooms equipped with all the modern facilities, keeping the old world charm intact. The Hotel is located near railway station on Sadhubela marg at the Sarvan Nath Nagar of the Holy City of Haridwar, Uttarakhand. Ganga Ghat is at distance of 2 minutes from the hotel, Market place at distance of 400 meters.The hotel is situated at a distance of 1 Km from the famous Har Ki Pauri where pilgrims all around the world pay their tribute to the divinity of Ganaga. 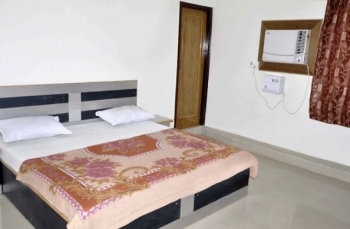 The hotel has a total of 21 rooms in a variety of categories under the category of A/C & Non A/C equipped with all the mordern facilities to make your stay worthwhile. The hotel has restaurant serving delicious cuisines and mouth watering dishes to the guests. Delhi (210 Km)> Ghaziabad (186 Kms)> Meerut (146 Kms)> Dehradun (55 Km)> Haridwar. The local bus stand is at a walking distance from the hotel. Jolly Grant Airport is at a distance of 32 Kms and is the closest airport to Haridwar and is 26 Kms from the capital city Dehradun. Public transport are available from the airport itself to Haridwar. Haridwar Railway Station is ever ready to host tourist and pilgrims connecting major township and regions of Uttarakhand to India. All the major cities are connected by Trains to Haridwar or Dehradun.